Protect your business investment with floor coatings that resist impacts and increase style. Many businesses choose concrete flooring systems for their durability and affordability, and Tight Line Concrete Coatings is the trusted name for providing high-quality products and installation services. With our Atlanta commercial floor coatings, you can give your dull concrete a more polished and finished look while increasing its durability and lifespan. Our BBB accreditation backs up our commitment to providing exceptional flooring systems, and we strive to provide personalized care and professional service with all of our floor installation services. Commercial Kitchen Flooring: With easy-to-clean and slip-resistant concrete coatings, your commercial kitchen becomes a safer and healthier place. 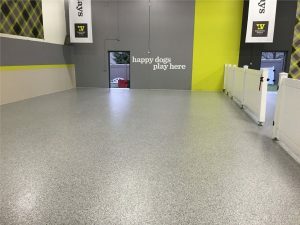 Dog Kennels: Simplify the operation of your kennel business and protect your customers’ pets by installing flooring that is easy to keep clean and sanitary. Locker Rooms: Our concrete coatings withstand high moisture levels, impacts, and abrasions to keep your business’s locker room in top shape. Salons: Add class and style to your salon floor by choosing an elegant concrete coating to match the aesthetic of your space. Showrooms: Want to show off your products? Our finishes create dazzling floors for any showroom while also being strong enough to handle heavy objects, such as cars. Your business deserves the very best in every aspect, including flooring. To have superior garage floor coatings or commercial floor coatings installed in your property, contact Tight Line Concrete Coatings today! Give us a call or fill out our online form, and we’ll assist you with scheduling a free, on-site estimate.